FC Barcelona B kicked off 2017 at the Miniestadi in style with a 2-0 win over Hércules, the league’s third-placed side to remain top of the pile. The match began rather evenly, with few chances early on as both sides looked to establish the rhythm of the game. Barça keeper Jose Suárez was forced into a good save from a testing Gaspar free-kick on 32 minutes. It brought a good reaction from the hosts however, as they soon after took the lead. Xemi glanced on Perea’s corner and, via deflection, found its way in the net to send Gerard López’s men on their way. The second half started in perfect fashion for the hosts as they grabbed a second minutes after the restart through Dani Romera. Aleñá’s corner was fumbled by the keeper and the ball fell kindly for Romera to tuck away a crucial second for his side. Miñano, Gaspar and Salinas all tested the gloves of Suárez in an attempt to get back into the game but the Barça stopper was equal to anything they threw at him. Alfaro came close to sealing the game in style for Barça late on with a solo effort but was denied by the crossbar. 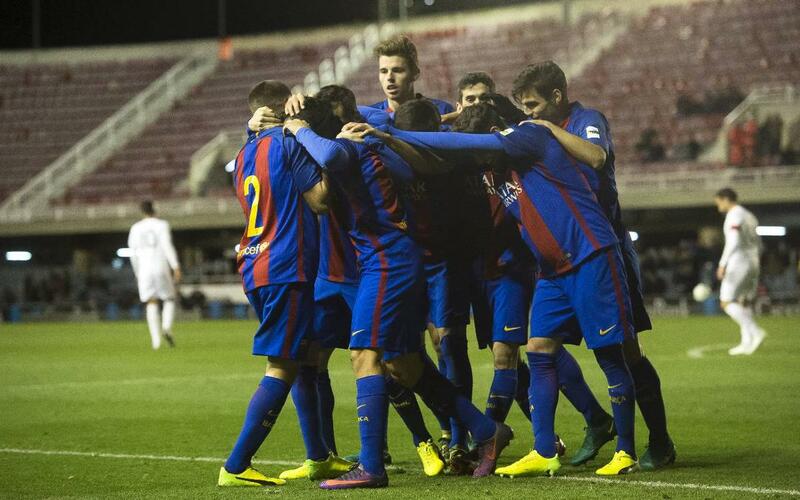 Nevertheless, Barça held on for the win and maintain their status as league leaders with 45 points.